MLive reporter Garret Ellison holds a shoe heel found amongst leather strips on the bank of the Rogue River. Wolverine used a waterproofing formula which included a PFAS chemical. At first, PFAS contamination seemed to be limited to air bases where a firefighting foam known as AFFF was used extensively in training, but chemicals within the PFAS family were also used in all kinds of manufacturing. MLive reporter Garret Ellison revealed the PFAS pollution problem was much more widespread in Michigan than previously thought. 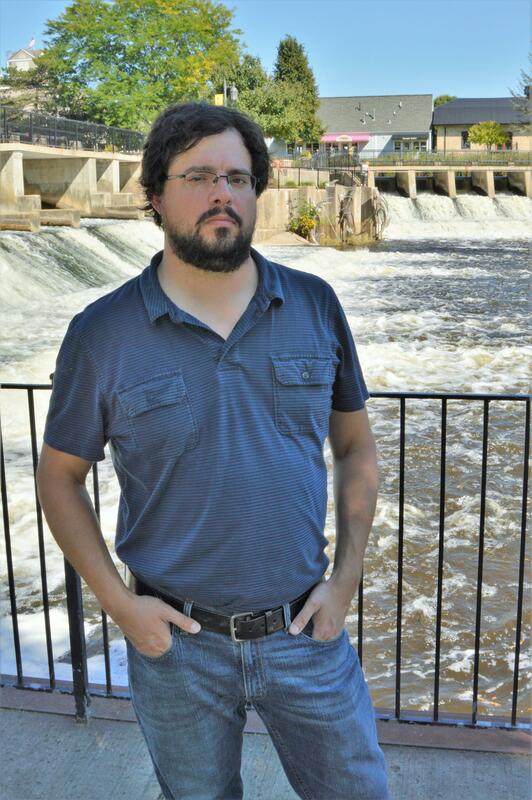 The wider story came to light because of a reporter for MLive named Garret Ellison. He’d covered the PFAS contamination story near the former Wurtsmith Air Force Base in Oscoda Township. Then some concerned citizens approached him about the possibility of contamination in Rockford near Grand Rapids. “The story is essentially that, ‘Hey, there’s this Scotchgard chemical and uh, it’s getting into the fish right next to the old tannery that, you know, by the way happened to use this stuff,” Ellison said as he walked along the Rogue River in Rockford. Scotchgard, made by 3M, was used to waterproof the Wolverine company’s Hush Puppy line of shoes. Scotchgard is made with a PFAS chemical. The tannery was right next to the Rogue River in downtown Rockford. Ellison took me to a spot at the river’s edge and showed me discarded leather scraps and shoe heels in the underbrush. “I found an old rubber shoe sole that said Hush Puppy stamped on the bottom and it’s just, you know, sitting here," he said, pointing to scraps of leather still littering the river's edge. Ellison has written about the scraps a couple of times. He's published photos. There was a cleanup, but scraps can still be found in the underbrush. There are still leather straps on the bank of the Rogue River in downtown Rockford next to where Wolverine once had a tannery. Ellison reported on the Wolverine site along the river and another site where leather scraps were dumped. The private wells in that area are contaminated with PFAS chemicals. Some of them are at much higher levels than the EPA advises. Those stories started to reveal a much larger problem. “I think that Wolverine is the PFAS story that really got the governor’s attention,” Ellison said. After Ellison started reporting on the Wolverine site in Rockford, Governor Rick Snyder assembled MPART, the Michigan PFAS Action Response Team. It’s a multi-agency operation that is now checking water sources for the contaminants. That investigation was launched last year, but the Department of Environmental Quality has known about the threat of PFAS chemicals for much longer. 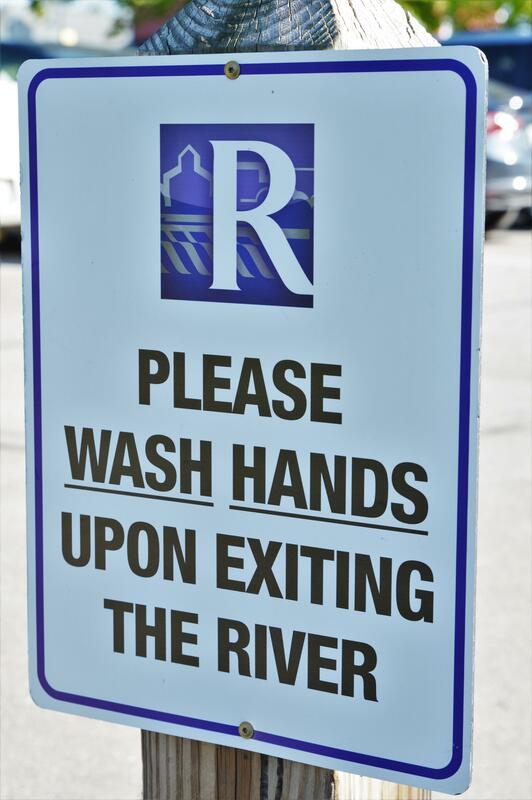 A sign next to the Rogue River in downtown Rockford, Michigan. Ellison also discovered that a Michigan Department of Environmental Quality employee wrote a lengthy report on the possibility of widespread PFAS contamination in 2012. “You know, it wasn’t a systematic cover up,” said David Savitz, an epidemiologist at Brown University who has a background in investigating PFAS contamination. He’s now Science Advisor for MPART. “It wasn’t something that was suggested and ignored. It really was just not on people’s radar screen and once we became aware of it –and that process continues to this day- we keep discovering new sources and new pathways for exposure,” he said. Despite knowing about PFAS health risks, it wasn’t thought to be a major issue in Michigan. The chemicals were not being manufactured in Michigan. It’s at those plants where PFAS chemicals were first connected to human health problems. There’s another reason we’re hearing more about PFAS contamination. Politico recently revealed emails from a Trump administration aide trying to block release of a health report on PFAS. That report suggested the current EPA advisory limit on PFAS in water might be four times too high. Politico reported the aide warned it would cause a “public relations nightmare” if people found out about it. PFAS chemical foam forms next to a dam in downtown Rockford, Michigan. James Clift at the Michigan Environmental Council says that report the EPA tried to suppress is eye-opening. “That’s where it’s really disturbing because this is a report that starts to say, ‘Oh, the levels we thought were safe in the past might not be,’” Clift said. So, the reason we’re all suddenly hearing about PFAS contamination in Michigan is because it might be a greater health risk than originally thought. And, the state is also looking for PFAS. Expect to hear about more polluted sites before the statewide survey is finished.